Few kidnap victims grow up to become police officers - but this is exactly what Nina Foster did. Following a frenzied stabbing she is drafted into her first murder investigation. With former rescuer DCI Stan McGuire as her mentor and John ('Wingsy') Wing as her partner, she thrives on the pace and banter that go with the job. As the body count increases and the force's biggest-ever manhunt gets underway, Nina is determinded to find the murderer. But when the story of her own traumatic childhood comes to light - a past she's worked hard to hide - her role on the team is threatened. Suddenly her job, her peace of mind and her safety are all in danger. And this time DCI Stan McGuire won't be there to save her. 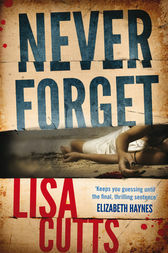 Fast-paced, and with a shocking twist, this compelling crime debut by police insider Lisa Cutts takes us to the heart of the Major Incident Room - introducing a gutsy new heroine to the crime scene.